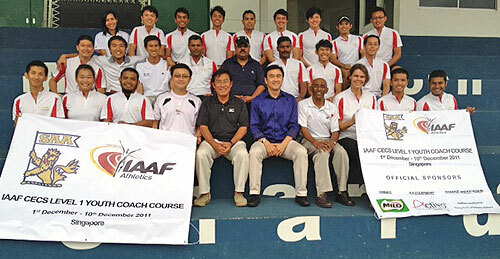 Congratulations to the graduating batch of IAAF Level 1 Youth Coach Course 2011. The photo with President Mr. Tang Weng Fei (centre), VP Training & Selection Mr. C Kunalan (right), VP Competition & Organizing, and Mr. Loh Chan Pew (left), VP Competitions Organising & Chairman, Officials. Photo courtesy of James Wong. Subscribe to SAA mailing list to be informed of such courses in the future.